This is the Barkeepers, a feature in which Eater meets the fine ladies and gentlemen behind the bar at some of Portland's hottest cocktail parlors. 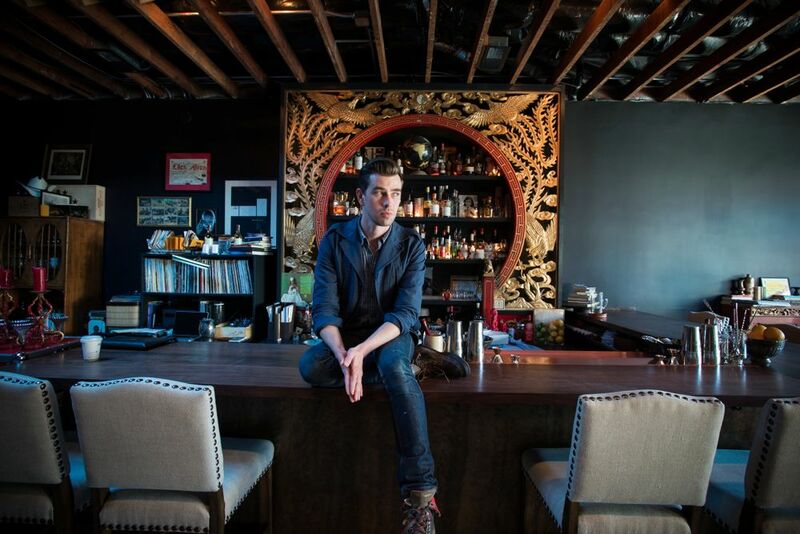 When acclaimed Portland bartender Kyle Linden Webster opened his first solo project, Expatriate, a buddy handed him a scrap of paper — a postcard Webster had written him years ago while mixing well drinks at a Clackamas dive bar, declaring his resolve to someday open a bar of his own. This past July, Webster did just that, uniting his exceptional, cool-headed cocktails with partner/wife/Beast chef Naomi Pomeroy's sophisticated, hot-tempered drinking snacks, under the watchful gaze of a repurposed landmark moon gate. He added a Grace Jones song or two, nixed the lights, and almost instantly became a prominent fixture on discriminating cocktail connoisseurs' regular rounds. Eater sat down with Webster to get the skinny on humble double Greyhound beginnings, the role hot water and negative ions play in cocktail recipe development, the proper way to handle would-be Marie Antoinette champagne flute purloiners, and why every good bartender needs jiggers, sound judgment, and Sade in his arsenal. Where did your initial interest in cocktails come from? Well, like most people in their early 20s, I drank gin and tonics. And in my mid 20s, I started drinking gin martinis, and in my late 20s I started making them. That was the progression for me. I wanted to work in bars, and so I developed an interest in cocktails. The first bar I ever worked in was a humble tavern in Clackamas, because they were the only place that would give me a shot without experience, and you've got to start somewhere. Then I got a job at the original Noble Rot on 28th and Ankeny, and I was studying lots of wine, so I became sort of a go-to person for wine knowledge on the floor there. How'd you transition from wine into cocktails? When Noble Rot moved up into their new space on Burnside and 11th, the former Rocket space, I had to give the bar manager a weekend, so I started bartending two days a week. That was my first exposure to jiggers and juice, to careful cocktails as opposed to the "double Greyhounds, don't be shy" call that I would always get in Clackamas. Did you always want your own place? Yes, in fact, one of my best friends from high school, as I was opening this place, gave me back a postcard that I'd written to him after having worked in the dive bar for two months, and in it, I announced my intentions to own my own place. I remember having those intentions, but I didn't remember writing them down on a postcard, so it was quite something to have him hand me back a piece of paper from five years ago that said XY and Z as I was finally getting to Z. 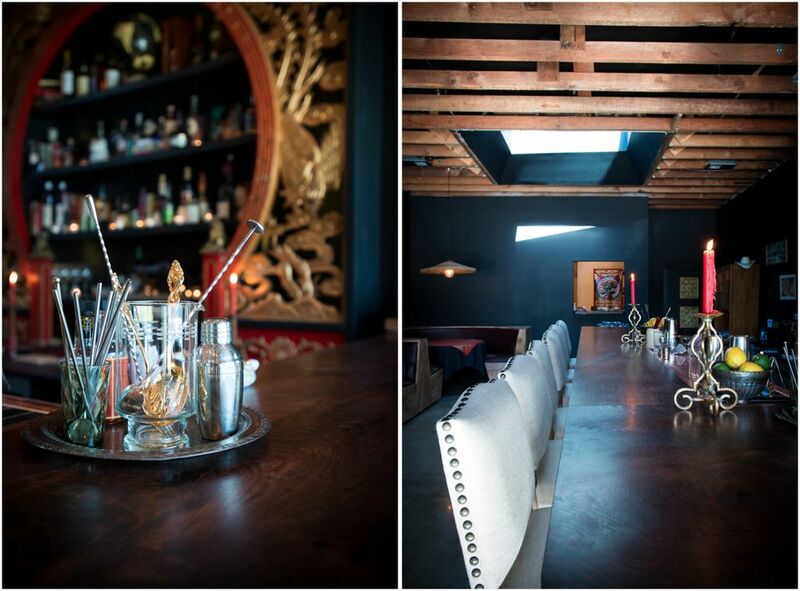 Is this exactly how you envisioned your bar, or did your concept evolve over time? Yes and no. A lot of the things in this room are mine, I've had them for years. The Chinese-American moon gate was an accident but I saw that and knew I had to get it, even at the risk of being pigeonholed as Southeast Asian. That was never the intentional focus here, despite the fact that we have a lot of Southeast Asian food. What's your creative process for developing a new cocktail? It's always different. If you say, I'm going to go in and develop a drink today, sometimes it flows easily, and then sometimes it takes 10 tries, and you're frustrated and your palate is blown, and you have to walk away. One of my most popular drinks ever, I made up in the shower. Because hot water and negative ions stimulate the brain and body and soul. Some of these I made up on the spot, one of them was a dealer's choice and it was just perfect. The Habitue. I actually tried to change it many times, but always went back to the original. And the No. 8 was something I've been playing around with in various forms for years. I probably first learned this flavor combination and profile at Noble Rot, before I was even a full-time bartender, and I've been playing with it every since. What's the most popular drink on your menu right now? The Replica. Because people love tequila, ginger, honey, lemon and mezcal. We can't make them fast enough. What's the crowd like in here on a typical evening? Neighborhood folk, foodies that read about you, industry people? It's all of those things, which is great. I love it so much. It's so important for me to be here for the neighborhood. There isn't a cocktail bar anywhere around, so that's why I'm here. I've been living on and off in this neighborhood for over 10 years. I moved up to Alberta and 23rd when there was just Joe's and Binks, and Binks didn't even have a liquor license, it was a beer bar. Expatriate's still new, but do you have any devoted regulars already? I have people who are in here three times a week. Some of them live across town and come anyway. I have a lot of friends from St. Jack who travel here, and lots of new people who aren't even necessarily cocktail nerds, who just want to come here for the atmosphere and experience. It feels really nice in here at night. True, the lighting is great. What lighting? The funny thing is, I actually had to toss my lighting design for this space. It's totally unfinished. These are my lights for cleaning. I was told I might get rejected by inspectors because what I wanted to do was something not yet in practice in commercial applications. So rather than risk losing thousands of dollars, I just did nothing. I will fix it, but it works for now. Considering the low light, any interesting PDA observed? Nothing out of the ordinary. There's always some slight snuggling and the occasional liplock with the hours passing. It's inevitable. Especially when we play Sade. And we do play Sade. We go from Grace Jones right into Sade if the moment is right. Andrew at Beacon Sound, this incredible record shop, my favorite in Portland, he gave me this record by Rhye, called Woman, and even if people are in committed relationships, it's breaking hearts every time it goes on. It's perfect, even better than mood lighting. Has anyone ever ordered a drink that's so cheesy you refuse to make it? I don't have the ingredients to make an appletini. I might try to make a fresh one, I might try to do something with Calvados. I'm not in this business to say no to people. I certainly have a very carefully selected range of bottles, I don't have poor quality spirits with bad ingredients or stuff made from gross sugars and shelf stabilized dairy. I don't have stuff like that because it's not good, not because I'm trying to be contrary. If you want the drinks I used to make in Clackamas, we're not the place, but that's not because I'm trying to turn my nose up, it's just a matter of being very specific about what I want to do, which is make cocktails well. Have you had to boot anyone out yet for being rowdy, or too drunk, or having a fake ID, or something in that vein? Oh yeah. I had a woman with a healthy sense of entitlement, who'd had dinner at Beast, come over here and order a drink, and then when her cab came, she looked at me and said, "I'm going to steal your glass and go get in my cab." And I said "Actually, that's a really nice piece of glassware, and I'd rather you didn't take it out of here, not to mention the fact that it's completely against the law and I can't allow you to do that." And she sort of went, "Hmmph!" and set her glass down, and then I turned around and she was out the door with my beautiful Marie Antoinette champagne flute. A total violation of liquor law. I yelled across the room for someone to get it, so someone went outside, and as she was getting in the cab, got the glass back from her. I was completely blown away by that. But not as blown away as by the fact that her friend then came angrily back inside because she'd tossed down a $20 dollar bill on the counter to pay for the glass before she left. I gave it back to her, then went went outside and asked them to never set foot in this place again. Because that's my liquor license at stake. That's my livelihood. Expatriate is a collaboration between you and your wife, Beast chef Naomi Pomeroy, so you've gotten a lot of attention for both your cocktails and your bar food. How has balancing the two gone so far? My wife happens to cook better food than most people will ever eat in their life, and I'm around that all the time, and it's a constant source of discussion and inspiration and playfulness. A lot of what we're doing here came from the spirit of the snacks she would make for me at night after getting off work at one in the morning, needing to quickly pad my stomach before I passed out for a few hours and then did it all again. The food's meant to satisfy on a very basic level, it's gratifying in a purely sensual gut way. How closely do you two work together on the menu? Which comes first, the drink or the dish? They are not meant to pair specifically, they just pair because they're both about the same things, which are quality, execution, and balance. A lot of people think they're meant to go together because they'll take a bite of something, and a sip of something, and be like "Oh wow, this was totally intentional," and it wasn't. We each do our own thing and it works. The food is meant to be drinking food, and so a lot of it is heavier, saltier, brighter in flavor, the flavors are louder. A lot of the food is quite spicy, we're not shy about it. It's meant to stimulate the palate and thirst. What's your favorite cocktail and drinking snack combo, what do you have after work? Siete Leguas tequila, and if I'm eating here, a tea leaf salad and some crab paste and corn noodles. Where do you drink when you aren't here? I'm always here. Honestly I haven't been going out. But I can't wait to go visit Eric Nelson at Trifecta Tavern. And finally, what is your must-have bartender tool? Sound judgment. You need to be the calmest, most self possessed, and obviously, the most sober person in the room, because you've got a lot of responsibility, you're dealing with taking care of people on many different levels, and if you're not present, and don't have good judgment, you're driving a car with one eye closed. So, sound judgment and presence of mind. And jiggers.